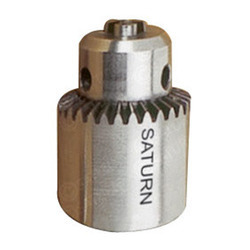 Manufacturer of a wide range of products which include stainless steel drill chuck. Marked by the usage of advanced technology, we are presenting a broad assortment of Stainless Steel Drill Chuck to our esteemed clients of every nook and corner of the world. These chucks are widely demanded for their perfect finish and other such features that stand our range far ahead in the market scenario. The offered products are used for drilling purposes in dental clinics and hospitals.